A prank phone call between a brother and sister involving a bomb hoax led officials to block traffic in both directions on San Diego's busy Interstate 15 on Thanksgiving afternoon. 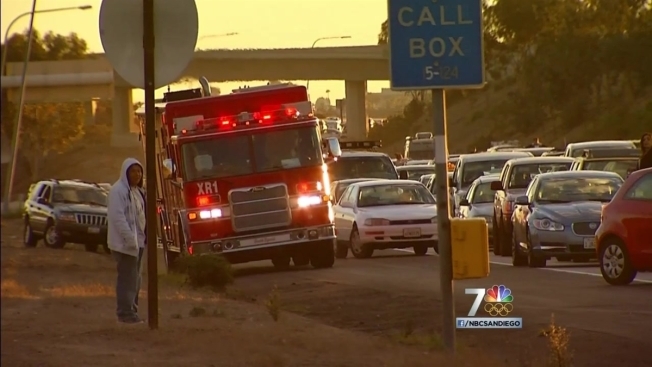 The freeway shutdown began around 2:45 p.m. at northbound and southbound I-15 near Miramar Way. Lt. Lorenzo Ruano with the California Highway Patrol said a woman was driving on the freeway with a friend when she received a phone call from an unknown person, whose voice she did not recognize. The person on the other end told the woman there was a bomb in her car. Frightened, Lt. Ruano said the woman immediately pulled over by the center divide on northbound I-15, just south of the Miramar Way overpass, and called 911. Authorities from multiple agencies, including the San Diego Fire-Rescue Bomb Squad, responded to the scene. CHP officials immediately shut down the freeway in both directions. At one point, all southbound I-15 traffic was being diverted to Miramar Way westbound, while all northbound I-15 traffic was being diverted to State Route 52. As of 4:05 p.m., motorists north of State Route 163 were unable to access I-15, a CHP official confirmed. Kearny Villa was also closed off to traffic. The incident quickly led to extremely heavy congestion in the area, with holiday drivers stuck at a bumper-to-bumper standstill as officials investigated the suspicious vehicle. Stranded, some motorists were seen getting out of their vehicles to stretch and talk to fellow drivers. By 4:20 p.m., Bomb Squad officials with San Diego Fire-Rescue had arrived on scene. Authorities questioned the woman in the suspicious vehicle. Police dogs were used to inspect the car. Lt. Ruano said the dogs acted in a manner that indicated there might be a bomb in the vehicle. Eventually, bomb investigators determined there was no bomb in the car. By 5:25 p.m., fire department officials said all bomb squad units were picking up their equipment and preparing to clear the scene. During all of the chaos, the brother who called in the bomb hoax called his sister back to apologize for the joke. Lt. Ruano said CHP investigators were there when the woman received the call from her older brother. The woman was crying, and Lt. Ruano said CHP officials felt her reaction was genuine, and she had no idea it was her brother who made that first bomb hoax call. CHP officials had the woman's brother -- now identified as Victor Diaz, 28 -- come to the scene for questioning. Lt. Ruano said Diaz was very apologetic, but his remorse simply wouldn't cut it. Most motorists stranded on the I-15 didn’t find the joke humorous, especially since many drivers were en route to their family Thanksgiving celebrations. Larry Howard was traveling with his entire family on the I-15, including his children. “We’re sitting out here and my kids started getting all antsy. So, yeah, it’s crazy,” said Howard. “I can’t even, I can’t even think. I’m just like, I can’t believe this is happening, on Thanksgiving,” said motorist Catherine Macabulit. “We’re stuck on the 15, so I hope we’ll make it out of here in time to have dinner,” lamented Anna McDonald. Some motorists agreed this incident would be one they would never forget. “Well, it’ll make for a memorable Thanksgiving,” Lauren Beadry told NBC 7. By 5:45 p.m., officials said Diaz had been arrested. He was booked into San Diego Central Jail on felony charges, including making a false bomb threat. CHP officials said the City Attorney or District Attorney will ultimately decide what happens next with the prankster. Diaz is scheduled to appear in court on Dec. 4. Both he and his sister are San Diego residents. In all, CHP officials said northbound I-15 was shut down for two hours, while southbound I-15 was blocked off to heavy holiday traffic for approximately one hour. By 6:10 p.m., all traffic lanes, connectors and ramps were open again in both directions and motorists were able to get going once again.